I recently expressed, in a blog named Where is the Idea in Strategy, that strategy acts on and enables ideas. Value is nested within the core idea and not strategy. Strategy’s job is the expressing of something pre-existent via the design and adaptation of assets, resources and activities that overcome the challenges impeding progress or the delivery of a desired outcome. A bad strategy can fail to manifest all potential value within an idea but a good strategy can’t create any additional value. At its extreme, no idea = no strategy. I discussed these concepts with Prof Nick Binedell earlier this month. He offered an additional insight. Ideas are contextual. Innovative or otherwise they are potentially capacitated through the coalescing of never before available elements or actuators that when utilized or expressed into offer the potential for new value to be created. These elements could be as diverse as they are varied – Emergent zeitgeist, a new technology, the simultaneous existence of technologies, critical mass of an existing technology being attained, growing insufficient supply of, etc. Whether the idea is sourced from or simply trades into the emergent context seems less important. Uber, has successfully utilized smart phone adoption rates, location tracking technology and increasingly congested cities to deliver an old service in a new way. This has gotten me thinking about what the minimal elements of an idea are. Interrogating the quality of our ideas requires an understanding of their parts. Repeated searches on the subject left me convinced that existing writing predominantly covers the commercial attributes on an idea. These include attributes like – definable market, differential business model, fundable, communicable, high margins, time to profitability, etc. 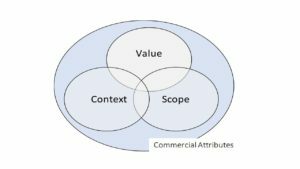 This blog attempts to express an initial and fuller version of what precedes the commercial attributes. The three layers precede the typical “must have” commercial attributes that most sources combine with the idea. The value layer expresses the problem and hypothesized solution relationship in its simplest form. Problem A will be solved via B, creating C. Value can be created by solving an old problem through a new form factor or an emerging problem with an existing or new set of elements. What’s critical is that there is a job-to-be-done and a new or better way to do it. If the job does not exist or solution is not doable there is no basis for the idea. Electric cars, free social messaging platform, one touch cashless transportation are examples that capture this layer. They execute on jobs that customers see as relevant, value additive and congruent with their values and lifestyles. As expressed above, the existence of some emergent elements that are changing either the nature of the problem or how problems can be solved or the benefits of doing so scaled. Value is enabled though a different problem-to-solution configuration. This layer is importantly able to act on or into a problem (old or emergent) through the creative configuration of something previously unavailable. Drones, nano technology, in memory computing, populism, urban transition, aging populations, emerging middle classes are context proxies. Their existence offers space for the expression of something new. Scope refers to the sustainability and scale of the job and the quantum of resource needed to deliver the solutions value in a viable way. Colonizing Mars is doable, offering sustainable long term benefits but at significant expense. Scope attempts to account for the practical usefulness and thus viability of the idea. This is dangerous. An idea that solves a problem for the unit of 1 or delivers massive value in 50 years is still an idea with value. That said, some element of sustainability of the job, solution and scale thereof is a requirement. The extent of each falls into the realm of judgment. Scope requires a call on how many potential customers have the need for the jobs value and how far into the future does one have to wait get a return on the value. For ideas to have commercial relevance and value they require the ability to be configured and brought to markets in ways that meet investor, provider and customer needs. Configuration refers to all the potential ways in which the problem-solution set can be designed and orchestrated into the market. This is the role of strategy. There may be many ways to do so with each having different cost, resource, processes and scale implications. Each configuration encumbers itself with both positive and negative attributes. This is where most “do you have a good idea” literature seems to reside. Ideas need to be fundable, have large growing markets, limited competition, opportunity for sustainable differentiation, manageable risks, clear and reliable profit streams. What’s important is that these are attributes of the strategy applied to the idea and not the core idea. An idea may have value and elements of context but lack the ability to be commercially exploited at this time. Changes in both the value and context layers may change this.